A few years back, my son, who was then in Class III, was told by his teacher to write an essay on a "real-life hero.” With no input form me, he chose to write about the kabadi walla, because “the kabadi walla helps us all recycle.” One winter evening, we wandered through a south Delhi scrap market, interviewing itinerant buyers and the owners of small godowns who were just finishing their day’s work. I think it was probably one of my finer moments as a father, and I've always been proud of my son for being willing to go into such unfamiliar territory. That experience sparked my interest in Delhi’s solid waste management system, which seems to be badly broken in some ways and extremely effective in others. 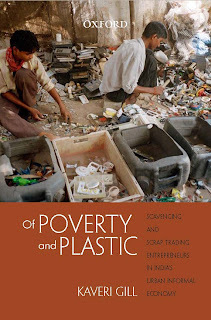 So last month when I saw Kaveri Gill’s book, Of Poverty and Plastic, I couldn’t resist buying it, in spite of it’s relatively steep price tag. I was not disappointed. Gill’s book is ambitious, engaging and meticulously researched. It reveals much about what is wrong –and right—not just with India’s solid waste management system, but with our post-liberalization economy as well. This is not an easy read: it is an academic monograph, and as such it is concerned with issues of theory and methodology that the lay reader may find challenging. But for those who work on issues related to poverty, development, waste management or recycling, this book will be worth the effort it requires. Gill did her research in slums where plastic workers live, and in the markets where they work. She draws her conclusions from a mix of quantitative household survey data and qualitative material gathered from focus groups and interviews. Gill accepts the idea made popular by Amartya Sen that a real measure of poverty must look at much more than just income. But she points out that this “capability approach” presents researchers with many problems when they set out to measure and compare poverty levels within and across countries. While Gill does not claim to answer every question she raises, she does manage to present us with a compelling picture of work and life in Delhi’s plastic industry. This isn’t the place for an exhaustive discussion of her conclusions, but there are a few lessons that stand out. Regarding poverty and development, it is true that the kabadi wallas, the itinerant buyers who buy and collect dry recyclable scrap, do better overall than waste pickers, who collect plastic from trash and “wet waste.” But Gill finds that when one uses the government's poverty criteria as a measuring stick, no group of workers in the Delhi plastic industry, including waste pickers, qualifies as “poor.” Given the work waste pickers do, and the conditions they live in, this finding suggests there may be something wrong with how the government measures poverty. Gill finds that, overall, workers in the informal plastic industry do somewhat better in terms of income than other informal sector workers living in the same slums. And if anything, the plastic industry is more equal in terms of income distribution than many other informal sector industries. It is thus not possible to blame the poor conditions of waste pickers on super-exploitative middle men. Careful analysis reveals that there is simply very little money to be made in this system, and that the owners of the plastic godowns are, like those who work for them, limited in both power and life choices. Scavengers and godown owners alike understand that their lack of social mobility results, in large part, from the “hard bar” of caste oppression which continues to exist in urban India. It is interesting to note that most post-liberalization job growth has occurred in the informal sector; this has reduced the access many of the most oppressed workers once had to formal jobs in the industrial and government sectors. This dynamic—growth based on high wage jobs for a very few, well-educated members of the elite, and informal subsistence wage jobs for the rest—raises important questions about the model of development we’ve been following for nearly two decades now. Turning to environmental issues, the book makes clear that India does an exceptional job recycling plastic: 60-80% of post consumer plastic is recycled here, as opposed to 7% in Europe and 10% in China. This should be celebrated, Gill argues, because instead of dumping our used plastic in landfills, we now turn it into cheap buckets and new shoes. Certainly the workers at the lowest levels of this industry deserve more respect and support from government and society at large. But Gill also argues that by the logic of capitalism, those who are at the highest level of this industry are not the villains they are often made out to be. Gill suggests they have played a vital social function by inventing--at considerable financial risk--new techniques and markets for environmentally friendly products. Gill argues that they are entrepreneurs in the best sense of the word. However, rather than celebrate this industry, too often elite groups and even middle class environmentalists endorse policies that do the opposite. Gill looks at the mostly unsuccessful drive to ban plastic bags in Delhi in 2000 and asks why it was aimed primarily at recycled plastic. Gill argues that this was true in part because middle class environmentalists in India, as in the West, tends to privilege “green agenda” issues like climate change and biodiversity over what she calls “brown agenda” issues like safe water, sanitation and housing. But one can't just blame the environmentalists. To some extent, Gill suggests, the ban the bag movement of a decade ago was hi-jacked by elite interests that were interested less in “green” or “brown” issues and more in making the city look “world class” by removing (or moving) unsightly plastic litter, slums and factories. Like many of us, Gill sees the problems in the system as it exists, but isn’t sure exactly what to do about them in the long run. Modern market economies are full of problems, she seems to say, but they are a reality we have to live with. Our post liberalization market economy, in particular, is producing unequal growth and is distorted by many things, including continuing caste oppression. Gill doesn’t tell us how to remake, or "recycle" this system. But she does a great deal to help us understand it. For academics and activists alike, this book and the questions it raises are well worth engaging with. I'll get a panel of eminent people together to judge the entries. Let's make the deadline two weeks from today. We'll be spending the rest of this week talking trash. On Thursday, we'll follow up this review with an interview with the author, Kaveri Gill. On Saturday, we'll have all kinds of trashy links. And if it is, who won? Lovely post, very well written. I've only just discovered your site but it's great, thanks!